Cannabis Hemp really can provide all the basic necessities of life: food, shelter, clothing and medicine. It has been said that, "anything made from a hydrocarbon can be made from a carbohydrate." Hemp is the cousin of marijuana. 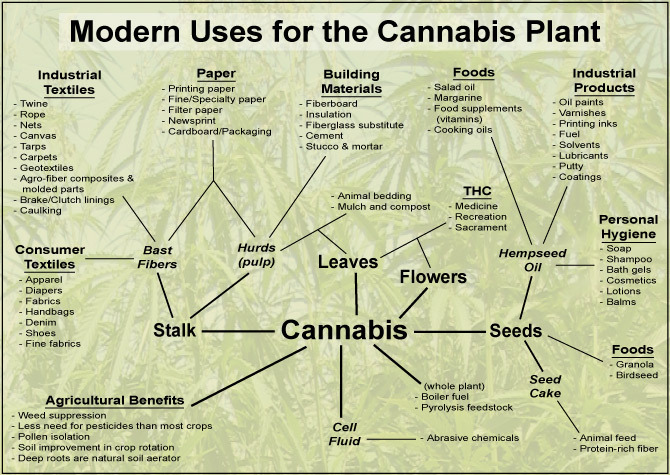 They are from the same plant - Cannabis sativa L. There are over 400 strains of Cannabis Hemp bred for various uses. The term, "Hemp" refers to the industrial use of the stalk and seed. "Cannabis", or "marijuana", refers to the smoking of the flowers. Intoxication requires high levels of THC TetraHydroCannabinol. Industrial hemp contains only .3%-1.5% THC. By contrast, cannabis contains 5%-10% or more THC. The plant itself is easy to grow in temperate climates, and requires good soil, fertilizer and water, but no pesticides nor herbicides. A hemp crop is usually harvested in 120 days after reaching a height of 10-15 feet. At that point one can make it into whatever suits their needs. a hard shell. Hempseed is used for people and animal food, medicinal preparations, and industrial use. The whole seed contains roughly 25% protein, 30% carbohydrates, 15% insoluble fiber, carotene, phosphorous, potassium, magnesium, sulfur, calcium, iron and zinc, as well as vitamins E, C, B1, B2, B3, B6. Hempseed is one of the best sources of Essential Fatty Acids with a perfect 3:1 ratio of Omega-3 linolenic Acid, and Omega-6 linoleic Acid, good for strengthening the immune system. It is also a good source of Gamma linoleic Acid (GLA) which is otherwise available only from specialty oils like evening primrose oil or borage oils. Whole seeds are made into: snack bars, cookies, burgers and porridge, or they may be roasted and consumed alone or in a trail mix. Wild and domestic birds love hempseeds. Hempseed is 30% oil, and is one of lowest in saturated fats making it good for lowering cholesterol levels and strengthening cardiovascular systems. The oil has a pleasantly nutty flavor. Among the foods made with hempseed oil are: sauces, butter, condiments and pesto. Processing of hempseed oil starts with drying the seeds to prevent sprouting. Hempseeds imported to the United States or Canada must be steam sterilized at 180F for 15 minutes to prevent further sprouting. The seeds are then pressed and bottled immediately under oxygen-free conditions. hempseed oil is very fragile, is not suitable for cooking, and must be kept refrigerated in dark, air tight containers. The meat of the seed is also highly nutritious and versatile as a seed "meal" and may be made into hemp milk and cheese, ice cream, and burgers. Left over from pressing the oil is press "cake" - high in amino acids and edistin protein. It can be crushed for animal feed or pulverized for flour to make breads, pastas, and cookies. Throughout history, hemp has provided a nourishing food supply to many cultures around the world. In Asia, roasted hempseed is eaten as a snack, like popcorn. In Russia, hemp butter was used as a condiment by the peasants. In Poland, seeds are used for holiday sweets. Hempseed was eaten by Australians during two famines in the nineteenth century. The most famous hempseed consumer was Buddha himself, who ate them during his fast of enlightenment. Other nonfood uses for hempseed oil are: lamp lighting, printing, lubrication, and household detergents, stain removers, varnishes, resins and paints. In this area, hempseed oil is similar to linseed oil. a process known as decortication. Hemp fiber contains a low amount of lignin, the organic glue that binds plant cells, which allows for environmentally friendly bleaching without the use of chlorine. In composite form, hemp is twice as strong as wood. All products made with hemp fiber are biodegradable. stretches the entire length of the plant. The length of the fiber enhances the strength and durability of the finished goods. Hemp can grow to 15 feet or more, making it excellent for textile production. Hemp is most similar to flax, the fiber of linen products. By contrast, cotton fibers are approximately 1-2 mm in length and are prone to faster wear. Hemp fiber also has insulative qualities that allow clothing wearers to stay cool in summer and warm in the winter. Long hemp fiber is used in twine, cordage, textiles, paper, webbing and household goods. The short fibers, or "tow," are the secondary hemp fibers .. While not as strong as the long fibers, the tow is still superior to many other fibers. Tow is extracted from the long fibers during a process called "hackling," a method of combing and separating the fiber from hurd. Short fibers are used to make textiles, non-woven matting, paper, caulking, auto bodies, building materials and household goods. Also known as shives, the hurd is the woody material found in the center of the hemp stalk. The hurd is rich in cellulose, a carbohydrate that can be made into paper, packaging and building materials, as well as plastic composites for making skate boards and auto bodies. As long ago as 450 BC the Scythians and Thracians made hemp linens. The Chinese first used hemp for paper making in 100 AD. Hempen sails, caulking and rigging launched a thousand ships during the Age of Discovery in the 15th Century. Drafts of the American Declaration of Independence were printed on rag papers that undoubtedly contained hemp. The USDA calculated in 1914 that hemp hurds could make four times as much paper per acre as trees. Hemp biomass as a source of fuel is the most under exploited, yet potentially the biggest industrial use of the plant. Hemp stalks are rich in fiber and cellulose with potential for use in the generation of energy. The hemp stalk can be converted to a charcoal-like substance through a process called pyrolysis, and used for power generation and to produce industrial feed stocks. Auto giant Henry Ford was a pioneer in the pyrolysis process, and operated a biomass pyrolytic plant at Iron Mountain in northern Michigan. Hemp as an auto fuel is another potential use. Almost any biomass material can be converted to create methanol or ethanol, and these fuels burn cleanly with less carbon monoxide and higher octane than fossil fuels. In fact, the diesel engine was invented to burn fuel from agriculture waste yet ended up burning unrefined petroleum. Hempseed oil can be refined to produce a type of hemp gasoline. The medicinal use of cannabis hemp is only now being understood and applied in spite of the fact that the herb has been a folk remedy for thousands of years. Nausea- for cancer patients while undergoing chemotherapy and AIDS patients, smoking cannabis is preferred over taking THC in pill form because it acts faster and patients are able to dose themselves more accurately. Intraocular pressure- for glaucoma suffers, cannabis relieves the pressure in their eyes that leads to blindness. Seizures- the cannabidiol in cannabis improves the condition of grand mal and partial seizure sufferers and allows them to reduce or dispense with conventional medications. Pain- for sufferers of migraine headaches, post-menstrual cramps, labor pains, multiple sclerosis, and cerebral palsy, cannabis reduces muscle spasms and tremors and allows them to avoid conventional medications with serious side-effects. Depression- for patients who do not respond to or who want to avoid the side-effects of other medications. One of the most enduring characteristics of cannabis as medicine is its inherent lack of toxicity. There has never been a recorded case of death from cannabis overdose in the thousands of years it has been used by mankind. Hemp has been a part of the Chinese pharmacopoeia for the past 4,000 years. Ancient Chinese folk remedies call for hempseed use to improve the "chi" or stamina of the body; to cure neurologic impairment due to stroke, urinary disorders, and blood deficiency. Externally, hempseed preparations promote the healing of sores and dry skin. Traditional hemp oil formulas were applied topically to treat abscesses, boils, pimples and swellings. Currently marketed products include lip balm, moisturizers, shampoos, conditioners, soaps, salves, perfumes, liniments. These hempseed oil mixtures do the same for the skin and hair that the oil does for the diet when taken internally. Journal of the International Hemp Association. HempWorld - The International Hemp Journal.